Nice shirt, and a smile. Must be good news ! As this is the summer that Sam promised us attacking football next season, he has gone and outdone himself by signing a defender! 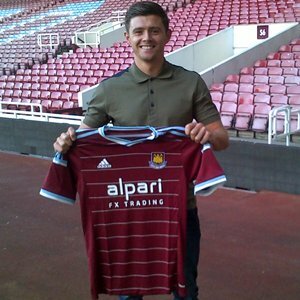 Left back Aaron Cresswell joins WHU from Ipswich for an undisclosed fee. I have stated before the we need to sort out our no 3 position, so I’m happy with this signing. I’ll be honest, I know nothing about the lad, but he comes with a pedigree of being used to play football (Tranmere and Ipswich) and looking at his record on Wikipedia, doesn’t suffer from injury or long spells out of the team. Obviously there is the issue of whether the step up in class will effect him, but I think he will be OK. He was voted in the Championship team of the year for last season by his fellow players, so things bode well. At least we haven’t bought any world cup one hit wonders (as yet), although there is always time. I think that Messi lad could do a job as cover for Nolan. Welcome aboard, and enjoy the inevitable ride. carmens blog has been removed 4 a couple of days now. i miss the nina pics. LOL.